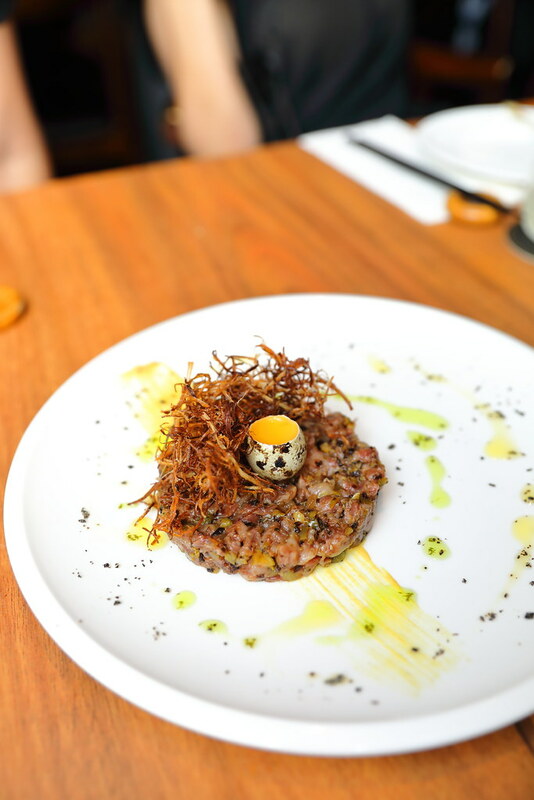 Boruto Sake and Tapas Bar at South Bridge Road welcomes new Head Chef Jay Lee and a new Italian-Japanese menu. 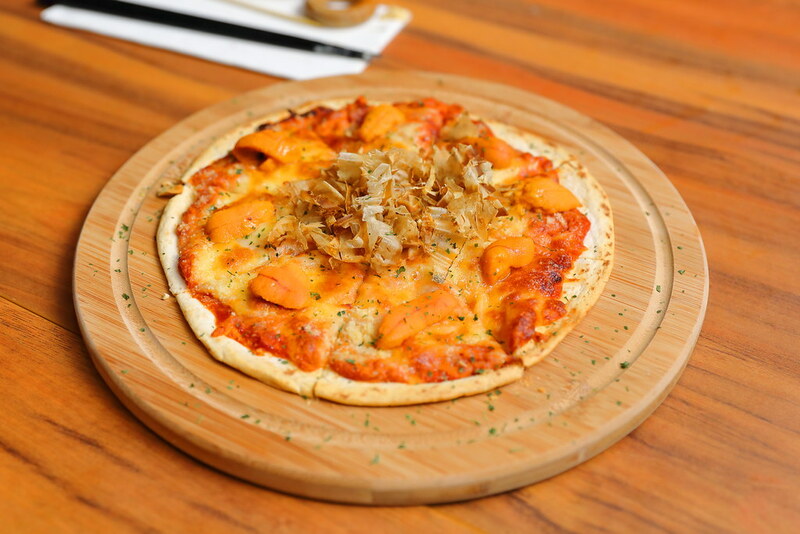 The refreshed menu retains its East meets West concept, featuring new dishes that can be categorized under salad, bites, cold dish, mains, thin crust, pasta, donburi, desserts and specialty. Great with a few cups of sake is the Risotto Croquettes ($10.80) and Tako ($12.80). 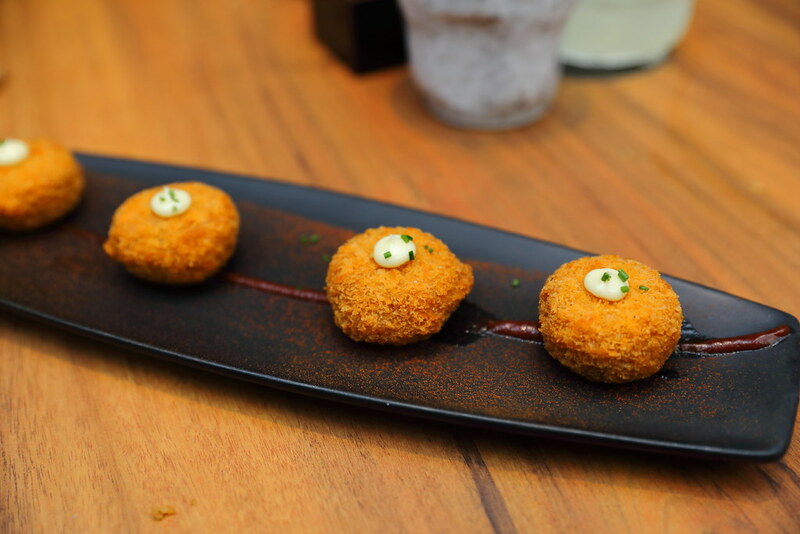 The potato croquettes are stuffed with tomato risotto encased in a crispy breadcrumb. Similar to having french fries with ketchup. The sweetness from the tomato risotto provided that needed harmony in flavours, making it an delightful one bite dish. As for the tako, it is enjoyed like popcorn chicken. 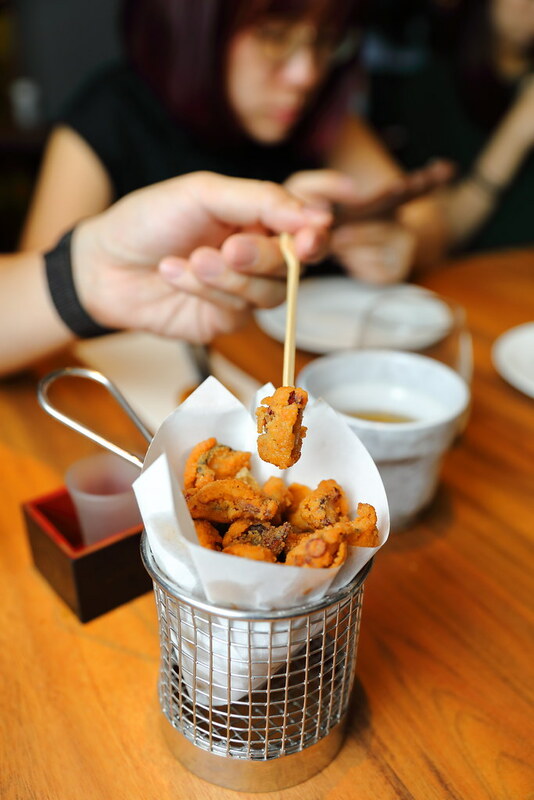 The deep fried octopus leg with wasabi shio, Japanese karaage style. The seasoning is super addictive. Luckily we have 2 serving or else we will be fighting over it. I probably have different view from my dining companions for the Foie Gras with Nashi with Cipollini ($26.80). 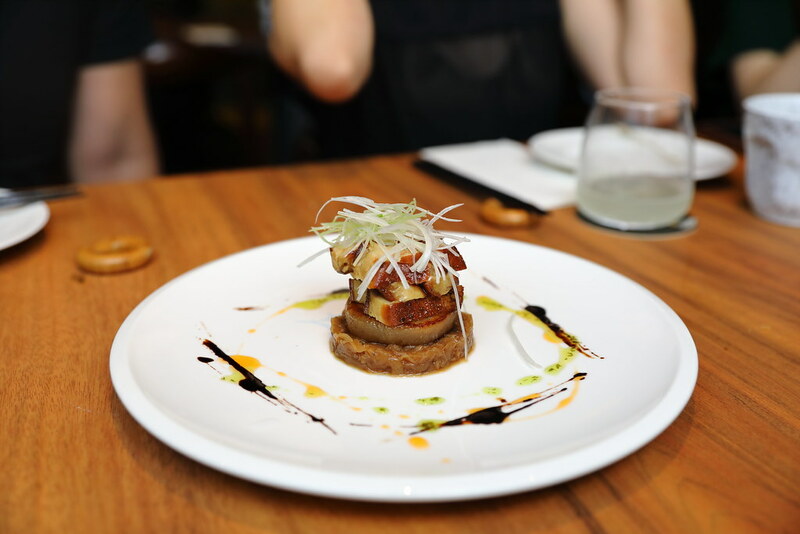 I love the sweetness of the caramelized cipollini onions which complemented the creaminess of the foie gras. However I felt the poached nashi pear is too sweet, masking the appreciation of the foie gras. One of my dining companions does not take raw beef but she could not stop herself from going for more of the A4 Wagyu Beef Tartare ($28.80). The traditional beef tartare is paired with gherkins, cocktail onions, capers and kombu giving it an Asian twist. 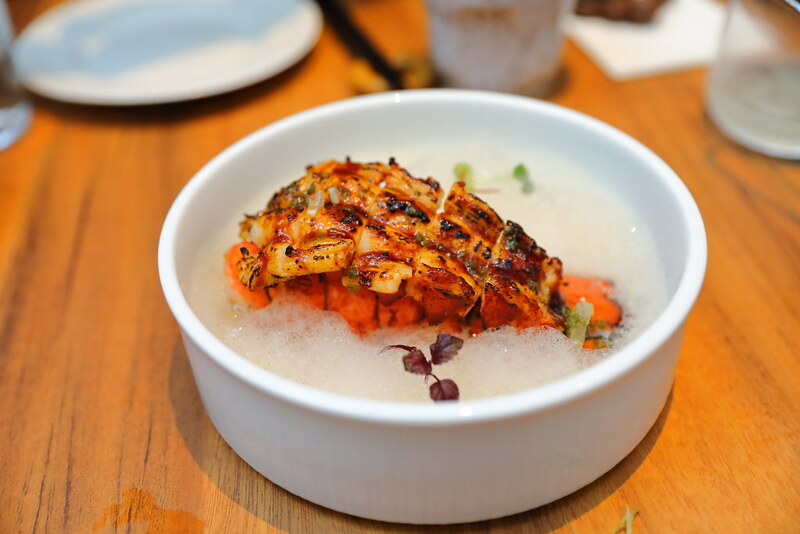 The Ise Ebi ($22.80) is a beautifully plated dish. The lobster tail is glazed with miso and grilled. The dashi foam with chive oil also created the visual effect, whetting up the senses for the bouncy lobster flesh. 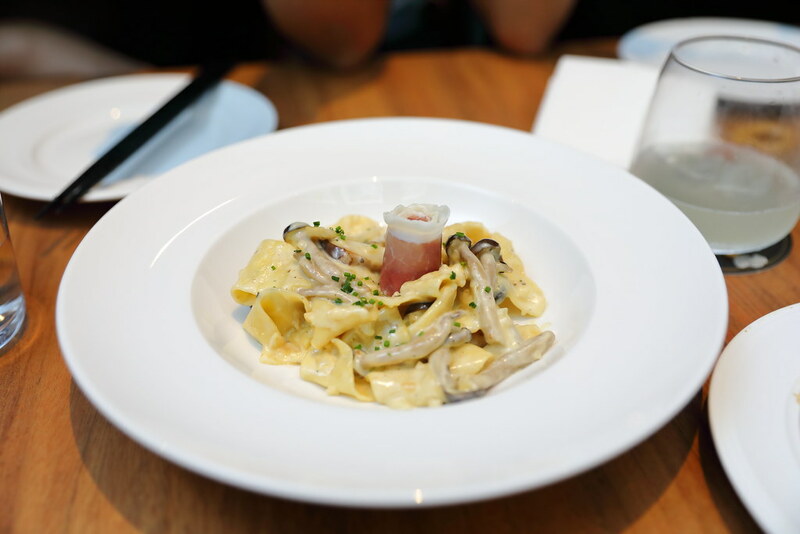 You need some carbo there is the Wild Mushroom Pappardelle ($22.80) and Uni and Bonito Thin Crust Pizza ($28.80). The chef handmade the pappardelle daily and this is cooked together with wild Asian mushrooms, prosciutto and drizzle of truffle oil. The taste of freshly made pasta alone is worth the calories. It may look simple but very well executed in terms of textures and flavours. While we all like the idea of the uni and bonito thin crust pizza, it uni and tomato paste was a very on the salty side which unfortunately didn't quite manage to let the fresh uni to shine. 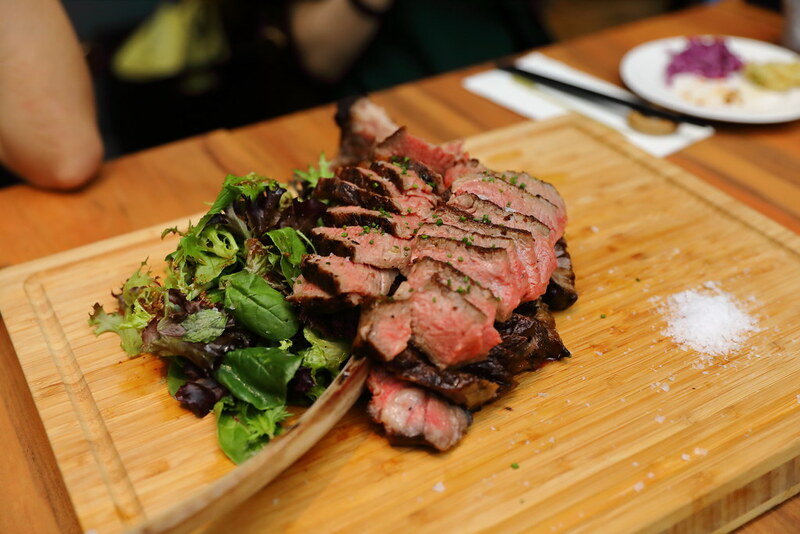 On the Borutos specialty is the Wagyu Tomahawk ($188.80) which is around 2Kg. 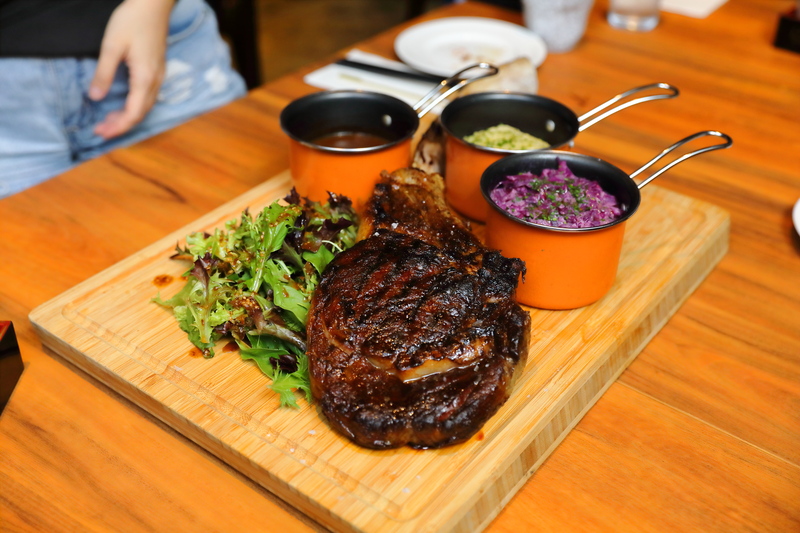 The grilled tomahawk steak comes with sides of potato mash, red cabbage slaw and brown gravy sides. This is idea for sharing. The meat itself was so flavourful that we either have it on its own or with just a pinch of salt. Advance orders and full payment is required for the wagyu tomahawk. 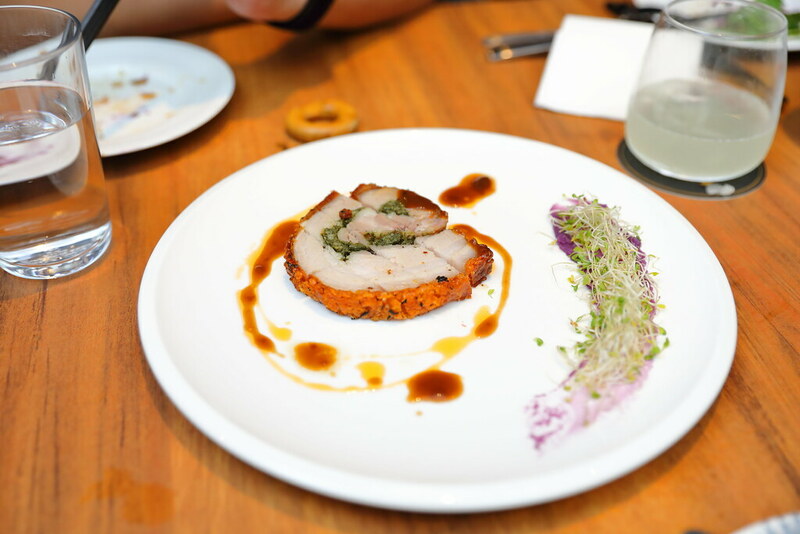 The Ton Toro Sio Bak ($22.80) will delight diners with its crispy crackling skin and juicy meat. It is served with Japanese sweet potato and brown gravy. Unfortunately the rub on the crackling skin was a bit heavy handed during our visit. It also has a whole Roasted Kurobuta Ton Toro Porchetta at $58.80 which needs to be pre-order like the tomahawk. 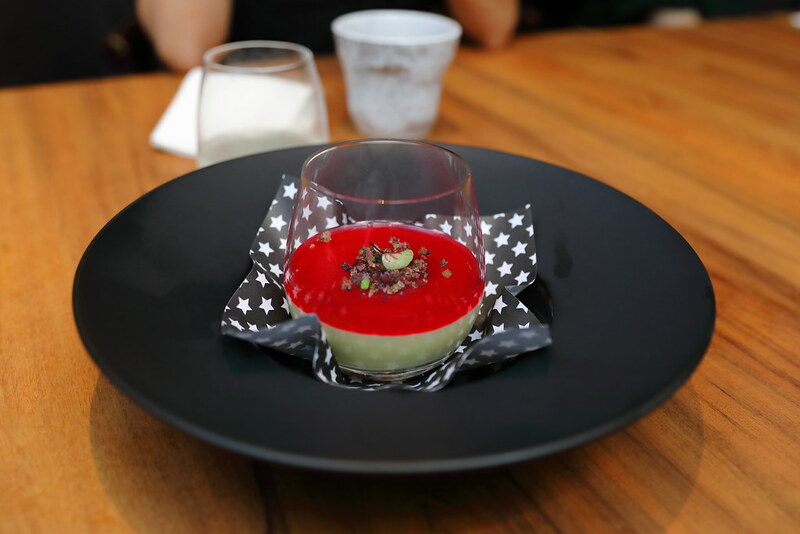 The Matcha White Chocolate ($12.80) comes in a glass of white chocolate mousse infused with matcha served with raspberry gelee. I like the play of sweetness and acidity which works harmoniously for this dessert. 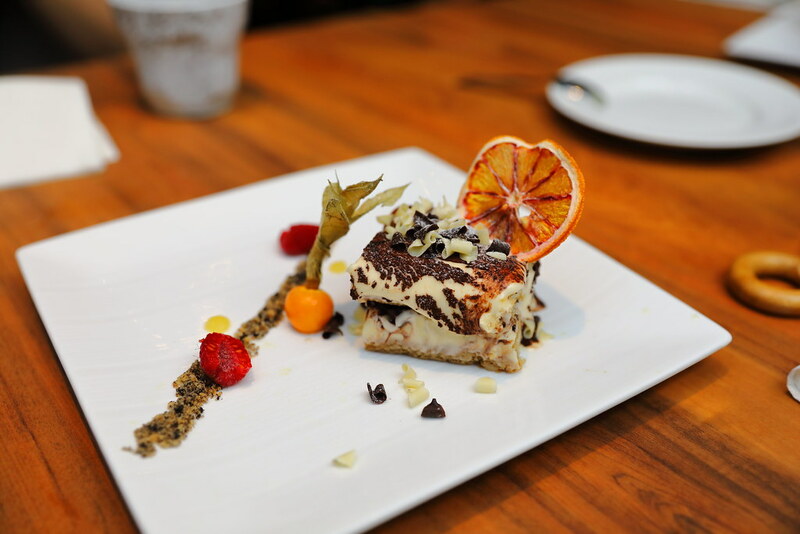 Last but not least, we have the Yuzu Tiramisu ($12.80). The characteristic of the Italian classic is elevated with the addition of yuzu and sake. The lightness and subtle flavours works for me. It didn't feel heavy after all the food. Overall I have enjoyed the new menu at Boruto. While there are some minor tweaks needed in some dishes, the concept works for me. I could taste the idea and potential that the chef wanted to bring to the table. Definitely looking forward to be back to try more of the chef's creation.